First up is this military-inspired jacket from Causeway Mall. I’ve been looking for this kind of jacket for sooooooo long! I’m so happy I finally found one! I highly recommend Causeway Mall‘s website. I’m sure you’ll find something. It’s a shopping mecca full of great and affordable finds. I mean take this jacket for example. It’s so affordable but it’s still fully-lined. How awesome is that? Next up, studs and leather. If you want to look tough and edgy, these two are your go-to pieces. Kapag hindi ka pa edgy sa lagay na yan, ewan ko lang! For my look, I got my red hot leather skirt from my favorite brand, Mango (yeeeeeeeheeees, I’m embodying a true Mango It Girl haha!). Then, I spiced it up with my studded belt and wedges. Another young accessories brand to watch out for is Project Muse. 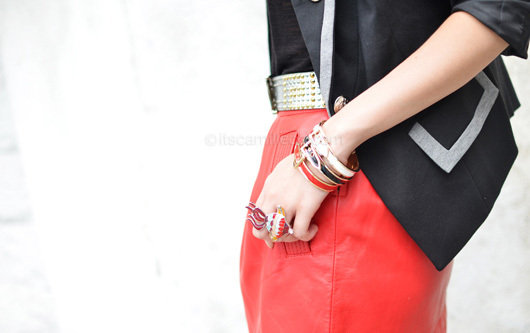 I love these belt bangles the most! Finished off with these sky-high wedges from Michael Antonio. They look so luxurious! I can just imagine the pain in my heart if I accidentally lose a stud, which knowing me, would probably happen in the next weeks or so. Oooooh well.